Pinedale is a small community of 2,’000 located on the western flank of the Wind River Mountain Range. Originally a ranching community, Pinedale now survives also on the oil & gas industry and outdoor recreation from the area. 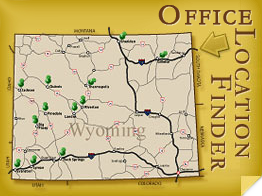 The Museum of the Mountain Man and White Pine ski area are located here. Pinedale is a stage stop of the International Rocky Mountain Stage Stop Sled Dog Race (IPSSSDR) each winter. Pinedale is located at 7,100 feet elevation. Each year in July, the town comes alive with the Green River Rendezvous celebrating the Trappers, Mountain Men, Indians and early Settlers of the area in the 1800s.